A charitable way to view Food and Water Watch’s intemperate and misguided attacks this week on carbon taxing is that these energetic activists are so consumed with fighting fracking, pipelines and mines that they haven’t had time to absorb how carbon taxes can help dry up the “need” for new fossil fuel infrastructure. An alternative take on their screeds in Yes Magazine and AlterNet is that FWW inhabits an ideological blind corner that sees carbon taxing as a neoliberal plot to undermine the climate movement rather than as a policy tool that can play a decisive part in keeping fossil fuels in the ground, forever. From Food & Water Watch’s home page. 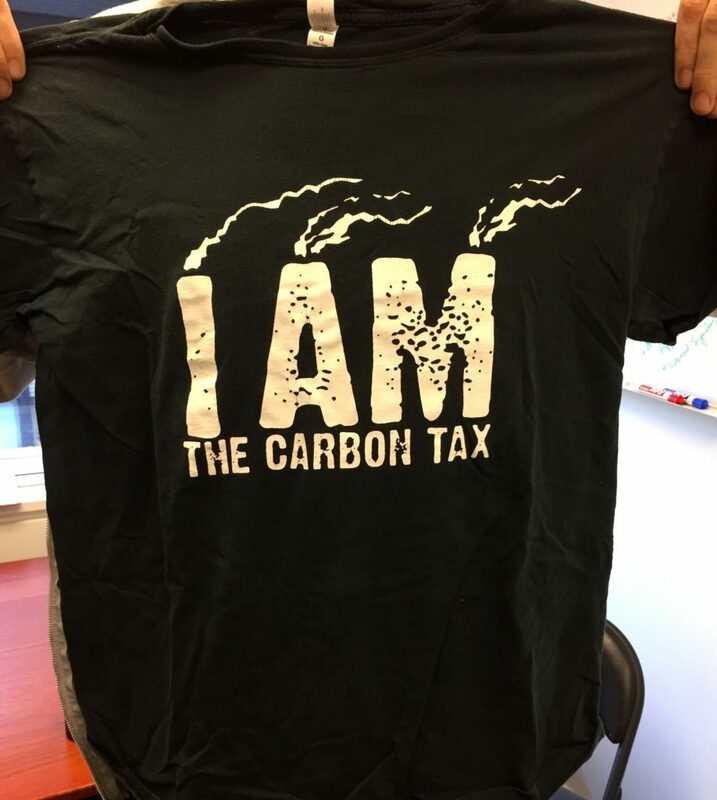 Shouldn’t you understand what a carbon tax is before you castigate it? Whichever, FWW’s case is toxic, simplistic and wrong. Toxic because its emergence in the home stretch of the carbon tax campaign in Washington state threatens to move critical Yes votes into the No camp on Nov. 8. Simplistic because the arguments suggest that FWW hasn’t grasped the ABC’s of carbon taxes. And wrong because the group’s criticisms of the British Columbia carbon tax — the Washington referendum’s political and policy template just across the border — are rife with errors. Just look at the headlines of FWW’s op-eds. A carbon tax helps fossil fuel companies? Sure, like cigarette taxes help tobacco companies and sugary drink taxes help soda companies. Or taxes on bullets would help the makers of assault rifles. In real life, carbon taxes are a mortal threat to fossil fuel companies because they destroy demand for fossil fuels — both by shrinking end-user demand (as people drive less, businesses adopt energy-efficiency measures, etc.) and by helping renewables out-compete them. Yes, from time to time Exxon CEO Rex Tillerson utters a positive word about carbon taxes — token ones that make for good p.r. but are 5-10 times smaller than those for which CTC and other carbon tax advocates campaign. Indeed, we’ve wondered if Exxon’s reputed support is a maneuver to turn naïve climate advocates against carbon taxing — “if Exxon wants it, it must be bad.” Fact is, Exxon doesn’t want robust carbon taxing; and even if it did, a policy should be judged on its merits, not by one of its putative supporters. Left-leaning economists like Robert Reich, Joseph Stiglitz and Robert Frank support carbon taxes. So does Ralph Nader. So did Bernie Sanders, in his outspoken, unvarnished, way, throughout the Democratic Party primaries. How much is Exxon paying them? FWW tips its hand in its thumbnail for the report on its home page (you’ll need to page down 5-6 times). The “tag” for the report is “Pollution Trading.” FWW could have written “Potato Chip” and been more on point. Carbon taxes are direct charges on fossil fuels according to their carbon pollution content, period. They’re simple and transparent. Nothing is traded, which means no market. FWW could learn from Tim DeChristopher and fight for carbon taxes and against carbon infrastructure. We’re well acquainted with emissions progress in British Columbia, from our December 2015 report, British Columbia’s Carbon Tax: By The Numbers. Sadly, the analytical criticisms of the British Columbia carbon tax in Food & Water Watch’s report don’t hold up any better than the rhetorical ones. Here’s a sampling. British Columbia’s GDP has grown considerably from 2008, creating the emissions pull that tends to accompany economic activity. Normalized per unit of GDP, 2014 emissions were down by 12% from 2008 and by 11% from 2009. 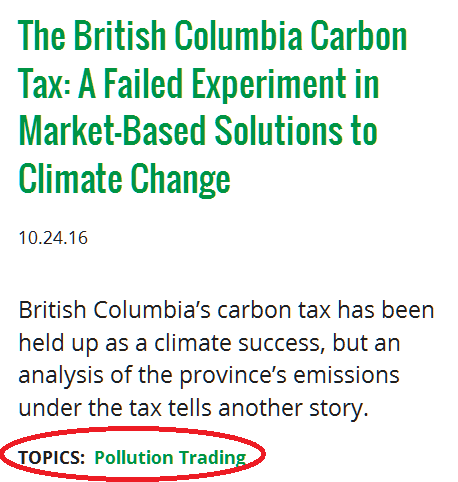 While that’s not enough, it’s around what one would expect from a “starter” carbon tax such as BC’s. Fact: Straw-man alert! It’s true that BC’s carbon tax is too low by an order of magnitude to get “80 by 50” or similar deep cuts. Its value, and that of the similarly designed (though more aggressive) Washington state carbon tax proposal, is to establish the template of carbon taxes, particularly revenue-neutral ones, so that not just provinces or states but entire nations can put robust, briskly rising carbon taxes in place. Indeed, earlier this month PM Trudeau announced that all of Canada will take precisely that step, starting in 2018. Fact: No, the revenues from the British Columbia carbon tax aren’t “refunded” or “returned,” they’re recycled on an economy-wide basis via tax cuts that are distributed to companies and individuals without regard to the amount of carbon tax they may have paid. This separation of revenue distributions (benefits) from carbon tax incidence (payments or costs) is fundamental to any “revenue-neutral” carbon tax, whether it’s one that primarily uses tax swaps such as BC’s or Washington’s proposed tax, or the “fee-and-dividend” model advocated by Citizens Climate Lobby. FWW’s miscomprehension on this basic point speaks volumes. Comment: We labeled this point a fact because the first part is true. Individuals, as final consumers of virtually everything our economies produce, do bear the costs of carbon taxes. That’s unavoidable, and it’s also the point, as we’ve written countless times. That’s why it’s important that carbon taxes such as BC’s and Washington’s be revenue-neutral; it ensures that low-income families receive disproportionate shares of the tax reductions or dividend distributions and thus are kept whole despite higher energy prices. The fight against fossil fuels stretches way back. 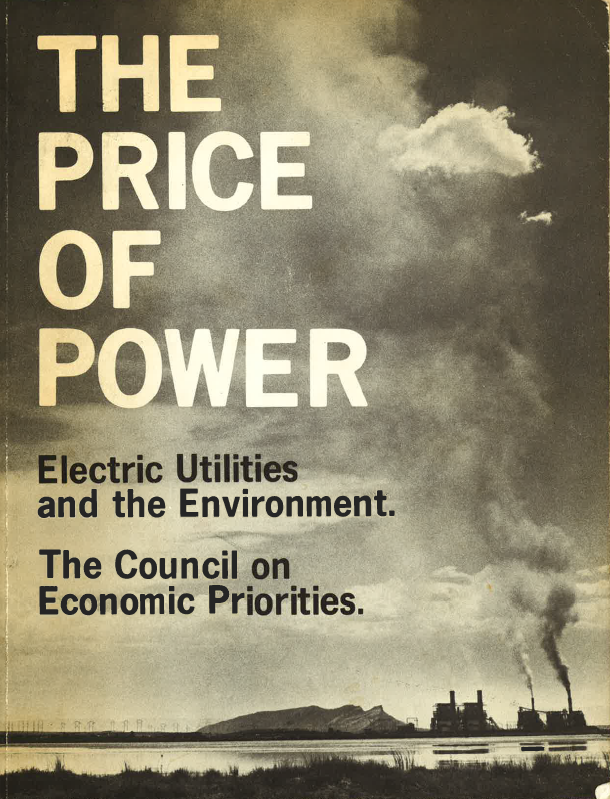 I co-authored this 600-page report on coal pollution in 1972. Fact: The supposed price-inelasticity of energy demand has become an article of faith for many on the political left — though whether it preceded or post-rationalized a distaste for energy taxes is hard to say. I’ve studied the price sensitivity of energy demand for decades and written about it extensively, most recently here. I can report that while gasoline is the least price-elastic of fuels, it’s far from inelastic (in my linked post I report a U.S. gasoline price-elasticity of around -0.35). This shouldn’t be surprising, insofar as most automobile use in both the U.S. and Canada is for non-work trips, which on average have a high discretionary component. There’s more, but you get the point. Lest my criticisms appear harsh, I note that I sought to engage FWW director Wenonah Hauter in a dialogue on carbon taxes last winter, after she published a letter in the New York Times disparaging the tax in British Columbia. Wenonah, like you, I’ve been in the trenches fighting fossil fuels for a long time. We may have different ideas about how to get to the same goal, but I hope we can both pursue that goal without running at cross-purposes. Addendum (Jan. 5, 2017): Several CTC supporters have drawn our attention to the assertion in FWW’s Failed Experiment report that from 2005 to 2013 emissions fell further in Ontario, which didn’t have a carbon-pricing system, than in British Columbia, which did. According to FWW, this shows that “mandatory replacement of fossil fuel energy plants with renewable, carbon-free forms of energy can rapidly and permanently reverse emissions trends.” Not quite. Ontario had low-hanging fruit that BC lacked: coal-fired electricity generation. And what allowed Ontario to eliminate coal-fired generation and put up impressive carbon-reduction numbers was increased output from its nuclear power plants: from 2003 to 2013, coal-fired electricity generation fell by 38 billion kWh while nuclear output rose by 30 billion as the nukes were expensively “refurbished.” Carbon-free, yes, but not the “renewable” energy FWW would like to credit. Methodological note: our calculations here, which add 2014 to the data in our year-ago report, exclude emissions from Public Electricity and Heat Production. This category — essentially electricity generation from burning fossil fuels — accounts for just 2 percent of BC emissions from fuel combustion but for nearly 20 percent in the rest of Canada. More importantly, that sector constitutes most of the “low-hanging fruit” for reducing carbon emissions, since electricity generation affords more opportunities for quickly and easily substituting low-carbon supply than any other major sector. Eliminating this category enabled us to compare changes in emissions over time — the heart of our analysis — on an equal basis between BC and the rest of Canada. Passing the first state carbon tax in Washington can be a keystone to climate change mitigation everywhere.. The opponents are simply wrong as the article spells out. The well intended environmentalists among them are sacrificing an excellent and important measure to favor an unpassable, unrefundable credit. Regrettably, opposition to a carbon tax (i.e. increasing the cost of energy) reflects a major obstacle to a sane and just energy policy. Social justice activists start with an ideological position of opposition based on their desire not to penalize the poor. This in turn widens the gap between environmentalists and social justice activists, who persist after all these decades in absenting themselves from other movements and believing that everything else but their crusade and analysis is reactionary and regressive. In doing so they embody the same faith in “economism” that unites the left and the right wing free marketeers: the notion that economics determines all other aspects of society and must take precedence to ecology and the environment. This is a distressing and long standing refusal to take environmental issues seriously and to educate themselves on these issues. Instead they still clamor for environmentalists to put social justice ahead of everything else, including rescuing the earth’s ecosystems and preserving its natural resources and habitat upon which human social welfare depends. We have a video: https://www.youtube.com/watch?v=Y5_lg1lkdpE. We used to feature it but moved it aside when we reconfigured the site. We’ll bring it back. Please tell us if you think it’s effective. Thanks. How about taking Denise Phelps up on her suggestion? We just replied to Denise. Let us have your thoughts about the video? Thanks.